CanOil is a distributor of CBD products. We have specialised in the import and distribution of high quality CBD products. We are also a specialised CBD e-liquid wholesaler. We supply only to companies and not to consumers themselves. Are you as a consumer wanting to order CBD products? Check out our points of sale on our homepage! For company's who want information about our beautiful products? Just fill in the form below and we will contact you as soon as possible. 1.1 Are CBD E-liquids legal? A frequently asked question from our customers is.... Are CBD E-liquids legal in Germany? And can we buy it from The Netherlands and sell it in Germany? We have put these questions to the Federal Public Service (FPS) Public Health, Safety of the Food Chain and Environment in Belgium. The answer was what we got. "The problem of CBD in e-liquid is currently under discussion between different administrations responsible for different legislations. There is no decision yet. Once that there is a Belgian position at this point we will communicate it". We conclude from this that there are no agreements on CBD E-liquids in Belgium, and therefore not yet prohibited. 1.2 How can I order CanOil products? 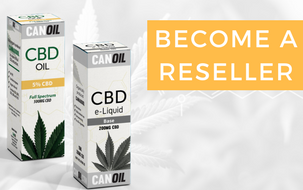 CanOil.com is a CBD Oil wholesaler, which means that we only supply resellers and (online stores). We do NOT sell to consumers themselves. The homepage contains an overview of (online) stores that do sell our products to consumers. As CBD Oil wholesale company, we are bound by the law to sell to companies and not to private individuals. 1.3 What is CBD E-Liquid? CBD E-Liquid is a liquid designed for the electric cigarette. By switching on the battery of the electric cigarette, the e-vaporator will heat up. This e-vaporator is located in the clearomizer (fill tank), which can be filled with E-liquid. By heating the E-liquid will be converted into vapour. This vapour can then be inhaled. Now CBD is also for sale as an E-liquid. The main advantage of CBD E-liquid is its calming influence. CBD E-liquid contains all the beneficial properties of CBD and gives no psychoactive effect. It is a great alternative for smokers. When inhaled, the body quickly absorbs the active substances. The maximum effect is reached within a few minutes. The dosage can be adjusted during inhalation. You can use the CBD rich E-liquids in most E-cigarettes and Vaporizer pens that work with 510 batteries and atomizers. 1.4 Is CBD oil legal? CBD oil is legal in The Netherlands and most other European countries. It is made of fibre hemp. For example, there are currently 2000 hectares in our own Groningen. Cultivated with the same hemp grown for fibre as used for the production of CBD oil. 1.5 Do I become high or stoned by using CBD E-liquid? No, our CBD-liquids contain no psychoactive substances and you don't get high or stoned from them. People do indicate that it is relaxing. 1.6 Does CBD E-liquid also help in my condition? We sell CBD-liquids as a food supplement and are not allowed to make medical statements. Many people therefore also benefit our customers by using CBD E-liquids. If you want to know whether CBD can also help with a certain disease or disorder, do some research on the internet. 1.7 What is the difference between CBD and THC oil? CBD is made from hemp and contains little or no THC. THC oil is made from Cannabis and contains a lot of THC and usually little CBD. THC oil is also called Rick Simpson oil and is illegal in The Netherlands because of its high concentration of THC. The two products are therefore completely incomparable. 1.8 How long is CBD E-liquid shelf life? The CBD E-Liquid is best stored in a cool and dark place, for example in the refrigerator. The liquid can then be kept for at least one year. Keep in mind that keeping the CBD E-liquid cold reduces its viscosity. Use CBD preferably at room temperature.